Practice What You Preach !! It has been awhile since my heart and my head have been in a place that would allow me to continue this thread of posts. For the past ten years or so, I have been living and working in a place where the wooden structures that I so love are a rarity. For a number of reasons, the least of which is another box checked on my personal bucket list, I have been plying my trade in the concrete jungle of NYC where indeed, wood is a seldom prized resource. As one would hope, given enough time, things do come around and the ship rights itself. And so it has in the life of this wood-wright, with the purchase of an 1890's wooden house on Munjoy Hill, Portland Maine. The East End was in its day a working class neighborhood where the families of those servicing the waterfront, made their homes. These days it is another frontier of gentrification and revitalization, where much of what is taking place in this process is to tear down the old wooden housing stock, and build new synthetic, multi-unit, condominiums. The fate of our house will be different in it's rebirth, restoration, and period embellishment. As I write this, the project is underway, and the house hovers six feet above the earth, on two ginormous steel beams, defying gravity, attracting much attention, and begging "please put me down". Although lifting and moving the house wasn't part of the original plan, it dawned on us in the early imagining, that in the process of dealing with a crumbling foundation and an absurdly close proximity to the house next door, that lifting and moving the house on the lot was the proper first step in the restoration process. It is a case of applying the old real estate adage, "location, location, location", on a micro geographic level. In this instance, moving it eight feet sideways, and six feet back on the existing lot. It's amazing what a difference a few feet can make, as it did in this situation. I will be posting photos on the "Project" page and continuing posts here as the project continues. And so begins the next love affair with an old wooden structure in dire need of salvation. Recently I visited the beautiful old home of a friend who just happens to also be a well known historian. We toured the grounds of his gentleman’s farm, surveying a collection of 'antique' buildings, which included the old hen house, a grainery, the cow barn, and last but not least, a falling down tractor shed that had once been shelter for the farm's work horses and farm equipment. Being of the mind that anything can be fixed, I suggested jacking the building, pulling the old mortise and tenon frame back in to place, and cabling the building, preparing it for another two hundred years or so of service. His response was both interesting, and considering the condition of the existing building, saner than my idealist’s approach to the problem. He said that his plan was to disassemble the structure and build a new one in its place with the old, salvaged, material. His logic was that the reuse of the indigenous material would create a structure that although new, if carefully designed and constructed, would be much more in keeping with the old farm, than one built with new material. Recycling had also been the basis of his logic as he set out to repurpose the old grainery as a guest house. Still in progress, the building has regained its once proud stature as an important building on the farm. As I travel my daily routes, I pass a number of old barns that unlike the grainery and the tractor shed, have not had the benefit of stewardship, concern and care. Often the farmhouse, once noble in purpose, has also been left to the ravages of the elements, no longer protected by a maintained roof, windows and doors. Knowing as we all do, that 'a stitch in time saves nine', one has to wonder when the critical day was that the stitch just wasn’t in time. As building costs have risen, particularly for homes which are carefully hand crafted, (yes, there are still some of them being built,) and building materials have become more synthetic with advanced technology, it seems that there remains a place for revitalization of the structures and materials of old. Another friend of mine has made his living by disassembling old barns and reassembling them as the beginning of new homes. His clients typically have some deep sense of the unique character that these old buildings once had, and are willing to commit their resources to the re-creation of that character. Their reward is typically a home that is unique, nurturing, and an aesthetically pleasing addition to the local landscape. 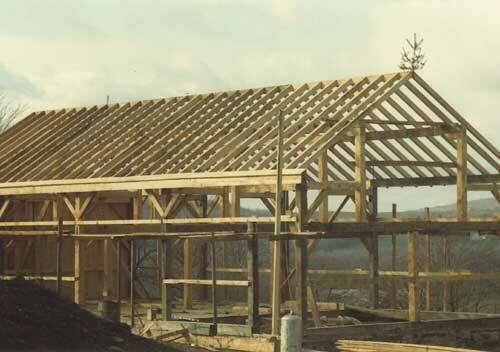 Further, the construction techniques of old often referred to as timber frame, if properly designed and assembled, provide tremendous freedom in the design of interior space and the placement of doors and windows. Add to that the soaring vaulted ceilings and the internal structural elements often found in these homes, and you have the potential for a truly “Oh, Wow!!! !”, one of a kind home. Revitalizing an old structure is also an exercise in resource and energy conservation. Consider the possibility that the timbers and boards were probably from first growth local forests, sawn at local saw mills, the foundation stones were most likely taken from local river beds and quarries, and all of these materials were probably horse drawn to the building site. Indeed there was considerable energy spent on all of this, but it wasn't carbon based. Just a thought !! For most people, a major renovation will be the largest project, in terms of time and expense that they will undertake in their lifetime. Although it does get easier after the second or third project, should you be a serial renovator, or you do this sort of thing for a living, it can be a pretty distressing and daunting proposition. While the simple solution might be to hire professionals to work out details and build the project, there are reasons that you might want to remain more closely involved in the design and construction process. The most important reason to participate is that for the dwelling to be a comfortable and nurturing home for you and your family, it must be the reality of what you envision. You must participate in the process from conception, and remain a design contributor throughout the project. There will be many times during construction when an unexpected possibility in design or materials reveals itself. These are the creative moments that will make the home yours. It's not unusual for the most successful re-modelers to spend a year or two thinking about what they like and want in a home. Accumulating a portfolio of visual examples from magazines, photos, and brochures will be invaluable in communicating your ideas before you have a chance to learn the terminology used by construction professionals. While reading books on architecture and design are helpful, there is nothing better than visits to successfully finished houses, local material suppliers, and buildings being renovated so that you can see and touch the materials that make a house a home. Once you have gathered enough material to adequately describe what you hope to build, you're ready to begin the search for an architect, or if building codes allow, a competent and reputable builder- hopefully, with a strong sense of design. Capomastro - Italian for master builder: He who maintains an experienced eye and steady hand in all aspects of construction, from concept through completion. The Capomastro respects the balance between structure and aesthetics, practicality and creativity. He works hand in hand with architects, designers, and owners to maintain fluidity of process and the integrity of results. As a Master Builder with over thirty years of experience, I do not separate design from construction any more than a sculptor would separate his vision from the stone and chisel with which he carves. I work closely with my clients, knowing that understanding their needs is as important as my knowledge of construction techniques, engineering, mechanical systems, and materials in helping them define the space that they call home. The intent of this blog is to provide a deeper insight to owners as they approach what will be a major undertaking, with which they have little familiarity, and to remind design and construction professionals of their responsibility to the environment, the community, and most of all to their clients. With forethought, craftsmanship, care, and a bit of luck, what we are building today will be here for a century or two, maybe longer, and will protect and nurture families that we may never meet.